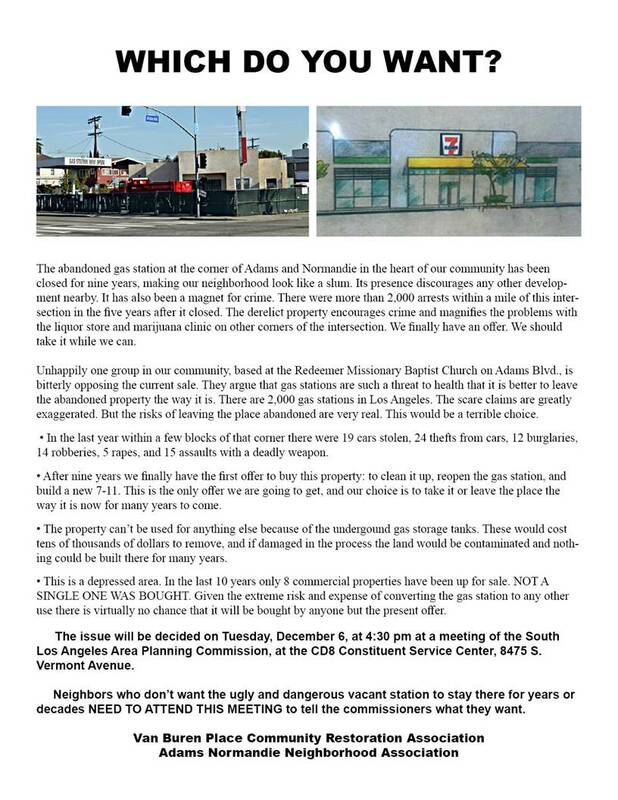 There is an issue afoot in the West Adams community which appears to have at LEAST two sides to it with a proposed gas station and 7-Eleven at the corner of Normandie and West Adams Boulevard. We are posting position papers so our community will be informed about the issues concerned. WAHA is not endorsing a position at this time but is providing the statements below in an attempt to inform the community about the hearings and issues. Please attend this hearing if you would like to have your voice heard and you have an opinion on this issue. We think it is unwise to obstruct the creation of something that is at least a normal business, that wouldn't act as a billboard saying that our neighborhood is a slum. No serious thought has been given by opponents of the 7-11 to how to get rid of the trashed gas station that is sitting there now.